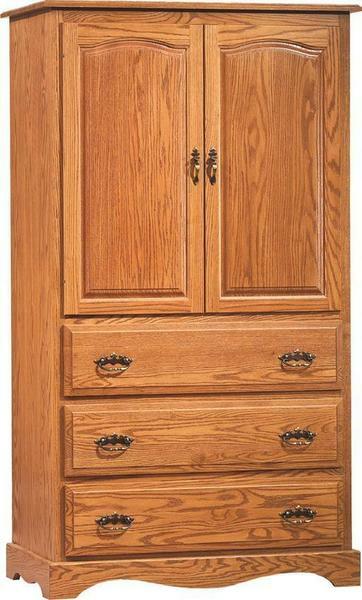 Add some much needed storage to your bedroom suite with our Amish Summit Armoire. The classically inspired design of this piece will bring the Early American style to life in any room you choose. Crafted from solid hardwood, with beautiful raised panel doors, beveled edge drawers, and a flowing base and foot design, this piece beautifully embodies the Colonial way of furniture crafting. At first glance, you'll notice two large, raised panel doors, each one opening to reveal plenty of extra storage space for your wardrobe. Below lies two drawers (with a three drawer option) - all of which offer dovetailed drawer boxes that coast on smooth full-extension slides. 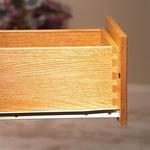 This offers easy access to all of the items inside and allows you to easily keep the drawers neat and tidy. Call one of our furniture specialists today to answer any questions or to start your order by phone. We also offer stain samples if you're torn between different options.